Taunton Longsword Club has trialled various forms of rules and scoring to both accurately reward/punish fighters but also to offer a fair representation of the skill displayed during combat. Therefore typically use a 3 x judges, 1 x fight coordinator/scorer set up whereby either one or two points are awarded for hit. 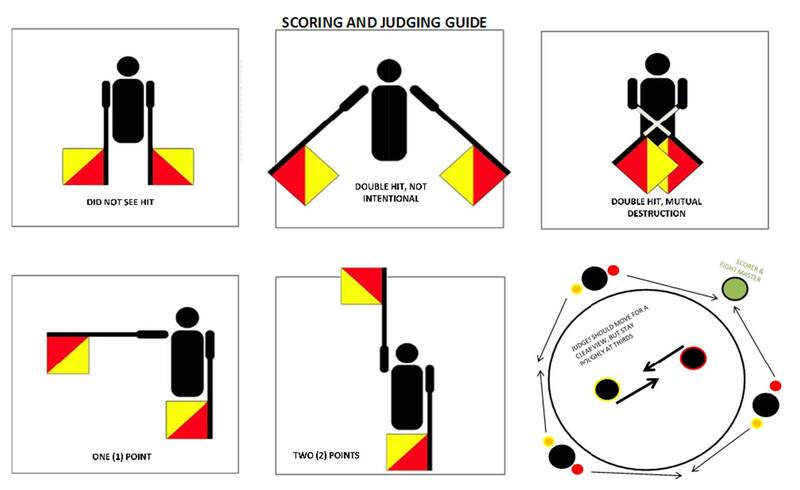 Each round can score a maximum of 7 points in total, awarded based on majority judge decision represented by a coloured flag being raised. Where the judges agree that a combatant has scored, there may be discrepancy as to the amount of points – in this case, the lower score is awarded. TARGET points are awarded based on the area of combatant hit. The head and torso are worth two points, the legs and arms are one points. QUALITY is awarded for solid, meaningful, and intended hits. Two points for a disabling or immediately life threatening wound, one point for serious but not immediately incapacitating. 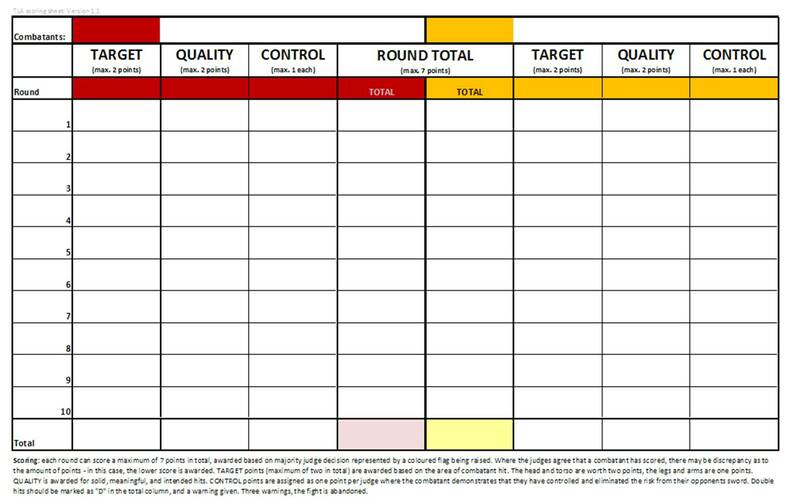 CONTROL points are assigned as one point per judge (cumulatively) where the combatant demonstrates that they have controlled and eliminated the risk from their opponents sword. Accidental double hits should be marked as a non-scoring round in the ‘total’ column. “Intentional” double hits where no thought of survival or parrying the opponent’s attack are marked as “X” in the totals column for the round and a warning given to both fighters. Three warnings, the fight is abandoned with zero score for either fighter being recorded. What rules do other clubs/tournaments use? There is little in the way of standardisation within the world of HEMA Longsword, much like in medieval times where each ‘Master’ would interpret the original and subsequent treatises (fight books) and teach according to their own style. There are some that argue for standardisation of the rules so that all fighters, globally, can compete on an equal footing – replicating the world of modern Olympic sport fencing (FIE). It is more historically accurate, reflecting the differences between ‘Masters’ teaching and conducting their students curriculums in their own fashion. Fighters are forced to learn the ‘whole’ art of [longsword] fencing rather than focus on only those parts that a standardised sport considers valuable point scoring techniques.